I was also inspired by Courtney’s blog, A Life Sustained. 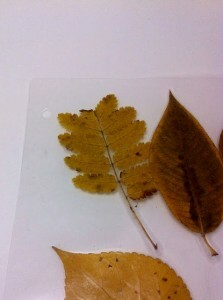 She shared the toddler activity of placing leaves on clear sticky paper. I decided to try this activity with my own toddler. The display was beautiful but didn’t last long. 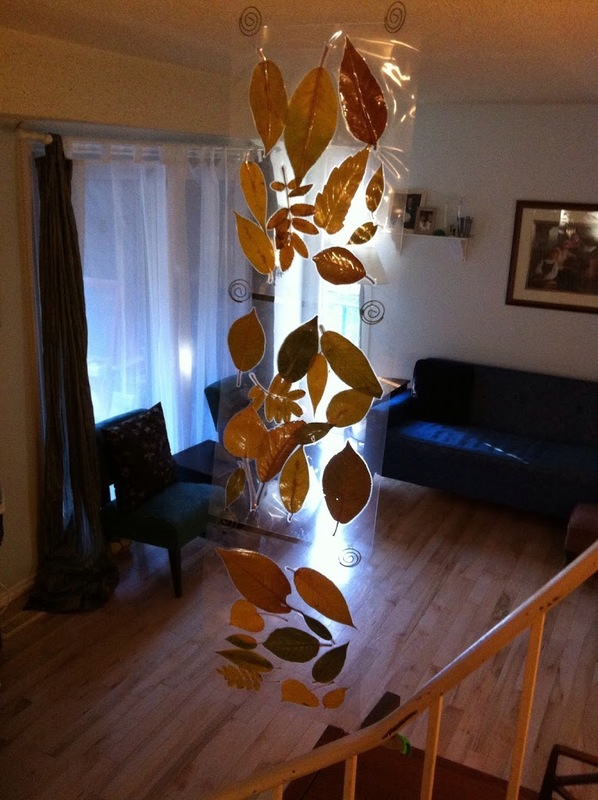 So, my oldest daughter and I created a simple, permanent, leaf display. 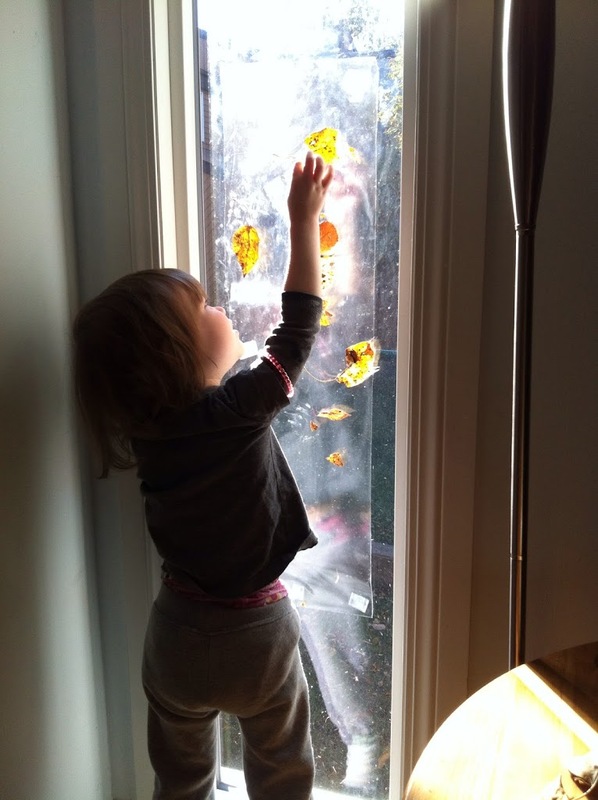 We refer to it as our leaf “curtain”. My daughter arranged leaves on laminating paper, we put the sheets through the laminator and then hole punched the sheets in order to hang them together. We connected the sheets with fancy, swirl-shaped, paperclips. When the project was finished we hung the leaf display. Isn’t it beautiful? So now that the snow is on the ground, we are embarking on a nature study about winter snow. I am so excited as my ideas are abundant and numerous! I look forward to sharing them with you in the near future! Love it! Our nanny did something similar with Little A. Such a great learning idea! I love this idea! We still have some leaves I can collect off the ground to make this. I can’t believe you have a foot of snow already. Wow! I’m down in Michigan and we’ve had a little snow, but it’s still warm enough that it melts. I’m so glad to hear you liked this idea. I would love to see your finished product too! I keep hoping our snow would melt… but alas, I think winter is here to stay. We had great fun with it… and it’s so pretty to look at too! Hi Jennifer! I LOVE your leaf curtain! That is so cool, I’ve never seen anything like that before. I wonder if you hung it by a ceiling light if it would be like a nature chandelier? Oooh, that would be lovely wouldn’t it! I’m sure it would work too! Wishing you a happy Tuesday as well! What?! You own a laminator? That’s as cool as owning a giant paper cutter! That is beautiful! I really like how it turned out. What a great lesson as well! I seriously wanted to do a wall of them. They’re so pretty! I’m getting into the groove of planning “lessons” that meet the content of multiple subjects! I love it! Thanks Tammy! I’m super pleased with it too! I wish I had more leaves… alas the snow has covered them up. I feel home schooling is even more challenging than just being a SAHM. I have a huge amount of respect for you. Thanks so much! This certainly is a learning process for both my daughter and I. I am enjoying it though. I would have loved to have met you and Madison in person… alas we would still be a few provinces away! Thanks Courtney… and thanks for the initial inspiration! Without it, I wouldn’t have this posting. Going to check it out right now! Yay! Yay! So glad to have you over today! I love your post!! Thanks Z! I love it. It’s challenging but in a different kind of way. Yay! Thanks for visiting and commenting! I encourage you to poke around Tiffany’s blog, she’s pretty sweet and a great blogging friend. Her daughter is a little over a year older than Dylan. I think you two would get along fabulously! Thanks again for commenting… I truly appreciate the kindness, enthusiasm, and encouragement you share with me. Thanks again for the opportunity Tiffany. You have a lovely corner of the internet and it was an honour to publish on your site. It is! I think I prefer the name “leaf installation” it sounds so much more distinguished than a curtain. Thanks for stopping by Cassidy! It’s always nice when we get to connect. Thanks for sharing that perspective Jackie! I agree! I just love the way your “curtain” turned out, and how you turned this into such a learning experience for the kids! Thank you so much for sharing with us on We Made That Wednesday!